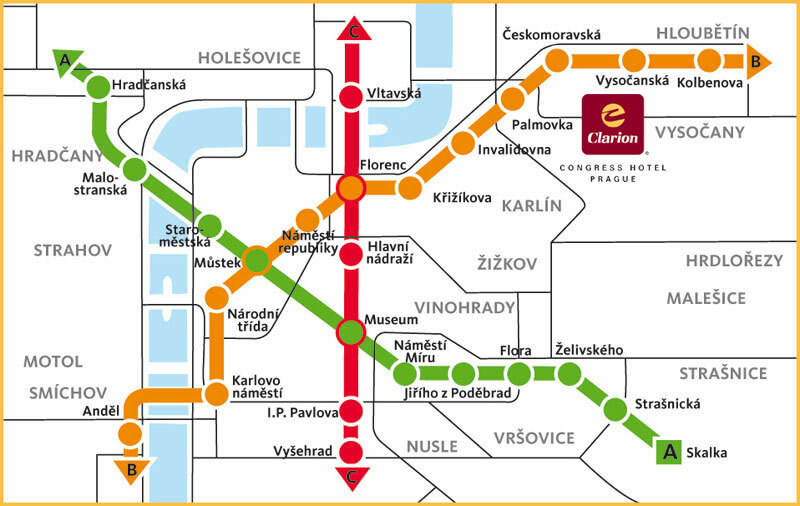 The Congress will take place in the premises of the Congress Hotel Clarion, Freyova 33, Praha 9-Vysočany (Metro station: Vysočanská, line B). The Congress language is English. No simultaneous translation will be provided. It is assumed that Congress participants will arrive and register on Saturday, 28 August 2010. The Congress office (Hotel Clarion, 1st floor) will be open for registration, accommodation and information on Saturday, 28 August at 9–19 h., and on Sunday till Wednesday at 8–17 h.
The Congress will officially begin with the festive Congress opening on Saturday, 28 August at 20–22 h. in the Congress Hall and adjacent rooms in Clarion hotel. Transport from the airport to the Congress venue (hotel Clarion) can be ordered for the price 15 EUR per person. We will pick you up at the arrival hall of the airport. The way back to the airport can be purchased for the same price. All participants including authors are asked to register for participation before 30 April 2010. Important: the submission of a contribution or indication of interest DOES NOT substitute the registration for participation. After entering your personal data you will receive a personal password which will enable you to access repeatedly your user pages. If you have already received a password and have access to your user pages then, please select “Registration Form” in the menu. After filling it in, the invoice for the registration fee will be immediately generated for you under the button “Review of invoices”. Please follow the payment instructions given there. If you would have any difficulties with the interactive registration form please inquire at org@chisa.cz and you will be immediately advised how to proceed. The registration fee includes attendance at the Congress, Congress materials, invitations to festive Congress opening and Congress concert. Authors pay the same registration fee as participants without contribution. The author who will deliver contribution(s) must register before 30 April 2010 and subsequently to pay registration fee. Already accepted contribution(s) will be withdrawn from the Final Program if the payment of registration fee for presenting author is not settled within the due date indicated in his invoice. The registration fee will be refunded (with a deduction of 10 % to cover the handling costs) if participation in the Congress is cancelled in writing before 25 July 2010. No refund will be granted after this date. For the reservation, please fill in the interactive accommodation booking form available in your user pages. If you have any difficulty with that form, please send an e-mail to org@chisa.cz and you will be immediately advised how to proceed. Since hotels require substantial deposits before the Congress, participants are kindly requested to settle the accommodation payment in advance and in complete. Upon receipt of the accommodation booking form, the Orgit Ltd. will send you a confirmation e-mail with instructions on how to make the payment. Payment should then be transferred within the due date indicated on the invoice. Please make your reservation as soon as possible and before 10 June 2010 to ensure booking of your accommodation as requested. no refund after 21 August 2010. Lunches will be available in the restaurant of the hotel Clarion. Lunches can be bought on site. Price will be 10 EUR per lunch – 3 course menu. Other catering facilities can be found nearby. Payments in the Congress office can be settled in cash. USD and EUR will be accepted but Czech Crowns (CZK) are preferred. Major credit cards will be honoured, cheques will not be accepted. Approximate rates of exchange:1 USD = 17 CZK, 1 EUR = 25 CZK. Participants are advised to arrange health and travel insurance and whatever insurance they consider necessary prior to departure. The registration fees do not include provision of insurance. The organisers do not assume responsibility or liability for personal accidents and loss or damage to belongings caused. Members: M. Atkins (NZ), J. Bone Ruiz (ES), C. Bouallou (FR), I. Bulatov (UK), C.-L. Chen (TW), V. Dovi (IT), J. Drahoš (CZ), M. Emtir (LY), D.C.Y. Foo (MY), A. Friedl (AT), M.C. Georgiadis (GR), P. Glavic (SI), D. Huisingh (US), J. Jezowski (PL), P. Kapustenko (UA), J.-K. Kim (UK), D. Kukulka (US), J. Labidi (ES), V. Lavric (RO), H. Lund (DK), K. Matsuda (JP), A. Meszaros (SK), M. Narodoslawsky (AT), P.H. Oosthuizen (CA), N. Ozalp (QA), S.J. Perry (UK), M. Picon-Nunez (MX), E. Pistikopoulos (UK), V. Plesu (RO), D. Reay (US), P. Seferlis (GR), S.K. Sikdar (US), R. Smith (UK), K. Urbaniec (PL), P. Varbanov (HU), E. Worrell (NL), G. Wozny (DE).